Waaaaayy back, soooo way back that I cannot find the original post or comment, Malar wanted me to post about 10 things I love. It's a tad difficult to work with such a broad theme. Hard to focus on 10 things. I mean...the world, my experiences - there's a lot to draw from right? If I really go into introspection mode, I will never produce 10 answers. So rather than overthink it, here are 10 random, mostly superficial things I love. Oh, and I enjoy this task more than a more seasonally appropriate 10 things I'm thankful for - that would really cause some analysis paralysis. 1) My Blackberry. I'm either getting old, losing my memory, or losing my mind, but my Blackberry allows me to keep to do lists, communicate things with people so that I don't forget later, set alarms, look up directions, and record names of books, movies, music or ideas that I don't want to forget. All without a million scraps of paper floating in my purse. I also do a modified Weight Watchers on my own and I track my points on my Blackberry. 2) For a while, I loved Bertha's language from The Fred Movie (I also love made for tv teeny-bopper movies). You add "ong" to every consonant and just say all the vowels. So for example, "Green" would be said, "gong-rong-E-E-nong". I got very proficient in this. My brother in law Todd is "tong-O-dong-dong". Get it? If you think I'm lame, just try it. It's addicting. 3) I love going to 5:30 am exercise classes. This is because by 7am, I've worked out, taken a shower, had a Nalgene bottle of water, and am in line at Starbucks feeling good and resisting all the sweet treats in the case. 4) I love Japanese food. I think I like it more than Chinese food. I told my mom I could eat Japanese food for breakfast, lunch, and dinner every day for a year and not get sick of it. I also love Groupons.com. I especially love a Groupon for Japanese food. For our belated anniversary, my husband and I did a little weekend staycation and went to a great place for lunch. I ordered soba noodles - one of my favorite noodles. The noodles arrived with what you see below as a condiment. Now I like to think that I'm not a culinary ignoramus, but I had to unabashedly ask the waitress what to do with it. 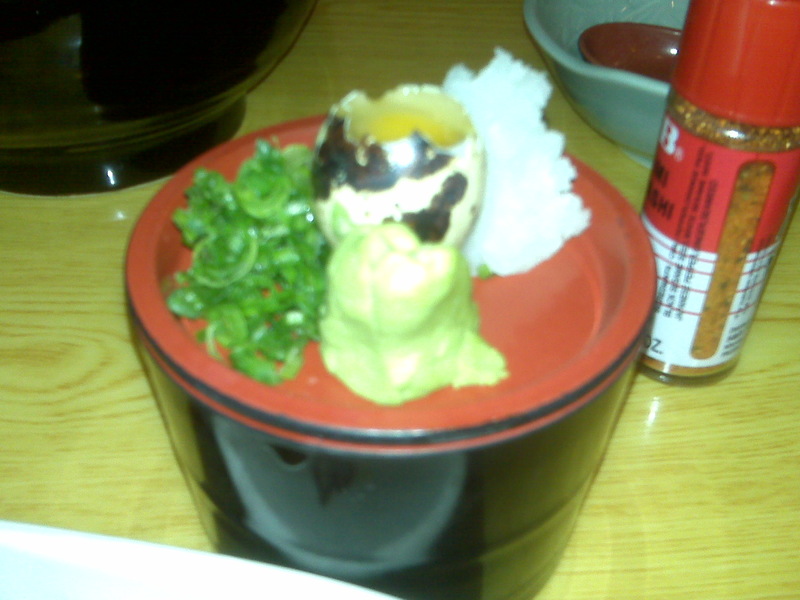 What you see is scallions on the left, minced radish, wasabi, and in the middle, a raw quail egg. Underneath the little plate is the sauce (I think it was tempura sauce). You dump the goodies in, mix it up, and then pick up the soba noodles to dip in the sauce as you eat each bite. Delicious and super fun!!! 5) I love my family. We're cool. I think we're great parents. Nuff said. 6) I love my DVR. Since I don't typically have daily TV time, I let it all record on the DVR and have late night marathons. The series that I DVR are: Grey's Anatomy, LOST (well, before it ended), So You Think You Can Dance, Hell's Kitchen, and Glee. I usually watch about 3 Grey's Anatomy episodes at once so I can have a big emotional cryfest all at one time. It's very cathartic. 7) I love blogging games like this one. 8) I love taking a day off work in the middle of the week. I love strolling out in public - wondering if the other good people of the world are also taking a day off, or if they have the luxury of not working, or what the story is. I love the lack of crowds, and of course, a shortened work week. I think ideally, I would love to work 4 10-hour days rather than 5 8-hour days. 9) I love Fridays at 3pm. No explanation needed. 10) I love Thanksgiving. I loved it as a kid - going to my aunt's house, knowing exactly what to expect, eating all the special T-day foods. We usually had the Western T-day foods as well as lobster and a few Chinese dishes. I always enjoyed seeing my cousins and b.s.ing about movies. As an adult, I think it's fun to host a big feast and help to create these memories and the comfortable predictability for others. This year (and now you'll REALLY think I'm crazy), I decided to make a "Thanksgiving Portfolio". This is basically a portfolio (in sheet-protected pages) of the menu, master shopping list, recipes I need to refer to, details that I need to remember (i.e. order a 14-16 pound turkey), and a schedule of cooking events (i.e. Tuesday: start brine, Wednesday night: make cold dishes, Thursday noon: do this, 2pm: start that, etc.). This way, I don't need to recreate the wheel each year. Plus, once I'm dead and gone, if my kids want to recreate the Thanksgiving of their childhood, they need only to pull the Thanksgiving Portfolio off the shelf. Well, there you have it. More than you'd ever want to know about the 10 things I love. At this point, I'm probably supposed to name some others to play along, but I would like to tag anyone on my blogroll, or anyone else reading this to go next! And between now and reading about your favorite things (please let me know you've posted), have a great Thanksgiving!!! hey Wendy, you are forced to let us know you more, and thanks for whoever forced you to! But whatever your likes are, i still and will always wait for the time i can eat the boiled young soybeans you have on your header! Haha, that is a play we love to do when we were kids, but now no more. Cant even find a dry mature soybean beans, just the processed tofu in the supermarket. I love your list Wendy!! I love soba also but have never had one with the quail egg. I like to exercise early too. It really wakes me up! Loved reading your list, it was fun, Wendy. My kids might like that ong thing. Hi Wendy, This was a fun post. I love your idea of the Thanksgiving portfolio... I'll have to check out The Fred Movie and the accent. It kind of reminds me of the teens who finish every sentence with a rise in pitch like it's a question. Does that make sennnnsse? That's a great list, Wong-E-Nong-Dong-Yong! And #2 is way more fun than pig Latin. I hope you have a great holiday surrounded by all your cool things to be thankful for! Raw quail egg? Seriously. I just almost gagged. LOL I'm so not adventurous when it comes to food! I love reading more about you, thanks to Malar. Happy Thanksgiving to you and our whole family! Happy Thanksgiving. You're making me hungry for a Thanksgiving feast of all Japanese dishes. When I was working I love to take off in the middle of the week. I go shopping! I hope you will all your favourite food this Thanksgiving. Have a wonderful time with your family!